140 • RV PRO • September 2018 rv-pro.com O R I G I N A L E Q U I P M E N T home to the Dallas Cowboys. Sarnafil is the only single-ply membrane to receive NSF/ANSI's 347 platinum rating. So, why can't Sarnafil have a presence in the RV industry? Buraczewski asks rhetorically. 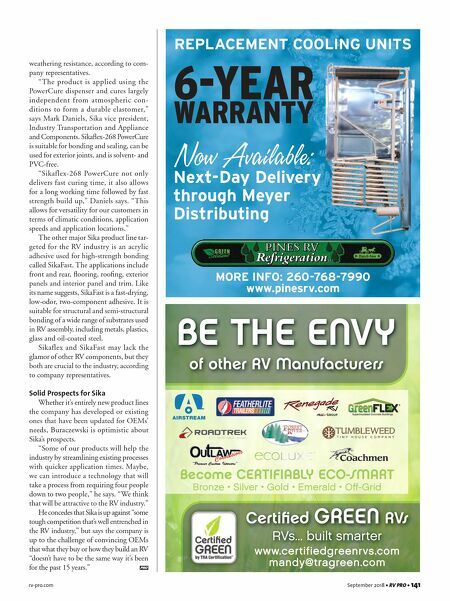 Sarnafil's 30-year lifespan, puncture- and fire-re- sistant qualities and ease in application (potentially half the time of a typical RV roof install) should make it very appealing, according to Buraczewski. "I think there is a market for this and I think there is some interest in this," he says. "The question is: Who will want to partner with us and help support us in our venture?" At the present time, Sarnafil is available in 5-foot-, 6-½-foot- and 10-foot-wide rolls. To make the product viable for OEMs and avoid costly waste, the material would have to come in other widths and Buraczewski envisions a major retooling effort would be required to produce these specific widths. Sika will undertake this retooling if it can get some partnership commitment from OEMs, according to Buraczewski. 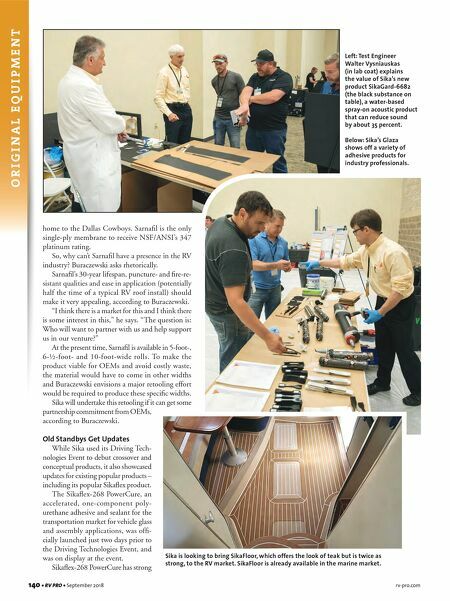 Old Standbys Get Updates While Sika used its Driving Tech- nologies Event to debut crossover and conceptual products, it also showcased updates for existing popular products – including its popular Sikaflex product. The Sikaflex-268 PowerCure, an accelerated, one-component poly- urethane adhesive and sealant for the transportation market for vehicle glass and assembly applications, was offi- cially launched just two days prior to the Driving Technologies Event, and was on display at the event. Sikaflex-268 PowerCure has strong Left: Test Engineer Walter Vysniauskas (in lab coat) explains the value of Sika's new product SikaGard-6682 (the black substance on table), a water-based spray-on acoustic product that can reduce sound by about 35 percent. Below: Sika's Glaza shows off a variety of adhesive products for industry professionals. Sika is looking to bring SikaFloor, which offers the look of teak but is twice as strong, to the RV market. SikaFloor is already available in the marine market.